When your shirt is loosey goosey and there’s a big possibility your bra can be seen, then girl, you need fashion tape. I taped mine to my bra and found the next morning that it was still sticky, even with the fashion tape ripped off. I was looking up ways to remove the fashion tape and stumbled upon the extremely helpful article linked above. Here is how I saved my bra! -Rub ice cube all over sticky area. -With your spoon, scrape the icy fibers off. Be careful not to scrape the material off. -With a rubbing alcohol soaked cotton pad, rub this onto the sticky area. You’ll see the adhesive start to pill. -With a cold water soaked cotton pad, rub off the excess adhesive bits. -Throw into the laundry machine and let the material air dry. This method has saved me from having to purchase another bra! I’m so happy with how well this worked and I just keep finding new ways to use isopropyl alcohol. See my first way here. Thank you for reading and for all your support. LOL! You and your isopropyl alcohol. 😀 Nice tip, though! LOL I can’t get enough. Need. More. 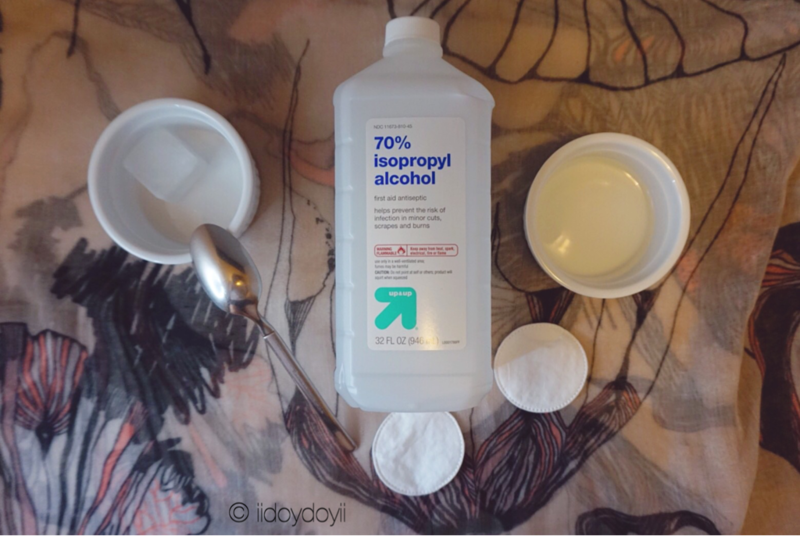 isopropyl alcohol DIYs!!! !